Unique solutions for unique needs! 3M has created a proven process for developing unique fall protection and access solutions. Whether it's an existing or modified product such as an aluminium frame system or frame rails, or an entirely new design, we will meet the requirements of your specific application ensuring maximum safety and peace of mind. In addition to system design, engineering, and fabrication, 3M certified, internally-trained technicians can provide industry-leading installation, training services and yearly inspections throughout equipment life for added safety and ease of use. Put us to work today and we'll demonstrate just how easy and effective it can be, to work in partnership with an organisation that truly understands your need for safe and reliable custom access solutions. Expert welders and fabricators bring your project to life. We will work together on final shipment and installation requirements. The C-Frame System is a versatile fall arrest solution for working at heights and is CE certified. 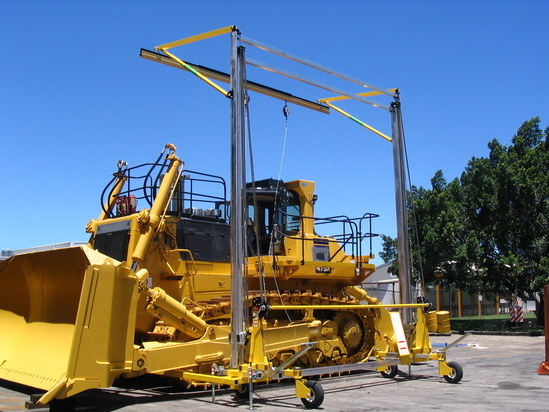 It is designed to be moved manually or with the use of a tow bar and service vehicle, and will require some clearance under the equipment being accessed to accommodate outrigger support legs. Fixed and adjustable height options available as well as pre-configured and fully customisable designs. The A-Frame System can be CE certified and provides a secure anchor point on a portable structure to give workers increased coverage and protection. Depending on the configuration, this system has the capacity to provide fall protection for up to two workers and can be easily moved from job-site to job-site, providing safe and reliable fall protection where you need it. The Box Frame System can be CE certified to provide a convenient means of securing a fall arrest rigid rail in areas with limited space or inadequate overhead structure. These frames are built to accommodate a specific area or piece of equipment. These units can be designed as permanent or portable frames, allowing for ease of relocation. The Counterweighted System can be CE certified to provide a portable overhead anchor point for multiple users while working at heights. These systems are designed to be counterbalanced by concrete or other means, allowing for close positioning to the work surface without obstructing the equipment being accessed. Each Freestanding Ladder System is CE certified and combines easy access to elevated work areas with 100% fall protection for up to two users from the ground up for the duration of the work being performed. System configurations include guardrails and the use of multiple SRLs on the system. 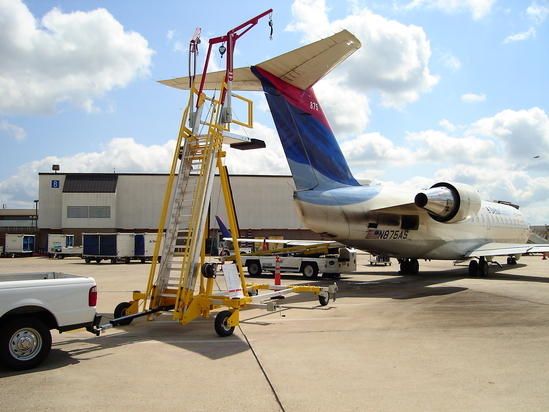 Portable Overhead Anchor Point Rolls Up to Your Equipment Providing Fall Protection to Workers! Easy Access to Elevated Work Areas with 100% Fall Protection!